On-site waste treatment, or septic system, is the management of household produced wastewater that is flushed or rinsed down the drain. The wastewater produced in many homes is not pumped or gravity transported to a wastewater treatment plant, but rather enters a septic tank on the same property as the home. This site will provide some information about on-site waste treatment and how to take care of the on-site waste treatment (or septic) system. 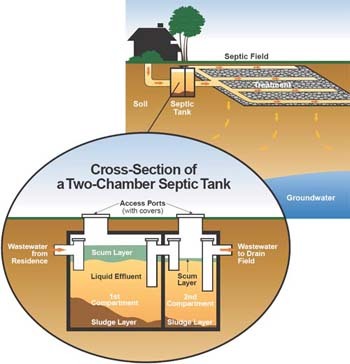 The following image was copied from the Utah State University Extension webpage on Water Quality and shows the major parts of the septic system. GA DPH Onsite Homeowners Guide provides information on septic tanks, operations and maintenance, and different types of systems. Use of Onsite Wastewater Treatment Systems in Georgia from GA DPH provides an overview of septic tank uses and best practices. Additives and On-site Sewage Management System from GA DPH provides frequently asked questions and answers about additives.